In this paper we introduce a variant of temporal logic tailored for specifying desired properties of continuous signals. The logic is based on a bounded subset of the real-time logic mitl, augmented with a static mapping from continuous domains into propositions. From formulae in this logic we create automatically property monitors that can check whether a given signal of bounded length and finite variability satisfies the property. A prototype implementation of this procedure was used to check properties of simulation traces generated by Matlab/Simulink. 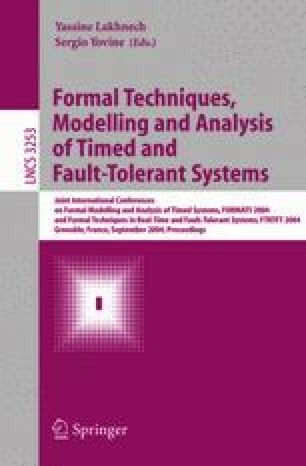 This work was partially supported by the EC projects IST-2001-33520 CC (Control and Computation), IST-2001-35302 AMETIST (Advanced Methods for Timed Systems) and IST-2003-507219 PROSYD (Property-Based System Design).